The "wrenching" (Rachel Maddow, The Rachel Maddow Show) first book by acclaimed journalist Michael Hastings (1980-2013), whose unflinching Rolling Stone article "Runaway General" ended the military career of General Stanley A. McChrystal. At age twenty-five, Michael Hastings arrived in Baghdad to cover the war in Iraq for Newsweek. He had at his disposal a little Hemingway romanticism and all the apparatus of a twenty-first-century reporter--cell phones, high-speed Internet access, digital video cameras, fixers, drivers, guards, translators. In startling detail, he describes the chaos, the violence, the never-ending threats of bomb and mortar attacks, the front lines that can be a half-mile from the Green Zone, that can be anywhere. This is a new kind of war: private security companies follow their own rules or lack thereof; soldiers in combat get instant messages from their girlfriends and families; members of the Louisiana National Guard watch Katrina's decimation of their city on a TV in the barracks. Back in New York, Hastings had fallen in love with Andi Parhamovich, a young idealist who worked for Air America. A year into their courtship, Andi followed Michael to Iraq, taking a job with the National Democratic Institute. Their war-zone romance is another window into life in Baghdad. They call each other pet names; they make plans for the future; they fight, usually because each is fearful for the other's safety; and they try to figure out how to get together, when it means putting bodyguards and drivers in jeopardy. Then Andi goes on a dangerous mission for her new employer--a meeting at the Iraqi Islamic Party headquarters that ends in catastrophe. 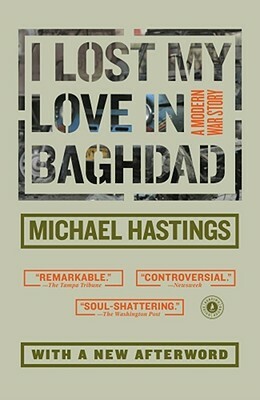 I Lost My Love in Baghdad is a searing, unflinching, and revelatory book by "a great reporter," who will be remembered for being "ambitious, skeptical of power and conventional wisdom, and incredibly brave" (Ben Smith, Buzzfeed) and who "leaves behind a remarkable legacy" (Rolling Stone). "[A] powerful debut...a tragic love story with broad appeal married to an unflinching account of wartime violence and brutality." "A wrenching book... Some people loved the book and some people hated the book for it being so personal, so emotional, and angry, but that was really the whole point, and that's why he did. Michael was angry. He was also loving and thoughtful and constructive and brilliant." -Rachel Maddow, "The Rachel Maddow Show"